If you’re turning to plastic surgery to look younger and prettier, you might be disappointed to learn that many procedures leave a scar. Though many often don’t think of cosmetic surgery as “true surgery,” certain procedures can be rather invasive and may leave several scars. Lucky for you, there are things that you can do to minimize scarring after surgery. Before we begin, it is important to note that none of the techniques described in this article are guarantees. There simply is no surefire method for making a scar disappear completely. These techniques are for reducing scars. First of all, a scar is nothing to be afraid of. Scars happen naturally when fibrous tissues bind an open wound together. Sometimes they fade and disappear, particularly when the wound is small and if some effort is made to help it heal, but sometimes a wound is just too large and a scar inevitably sticks around. Scars are also more likely to remain apparent if the deeper layers of the skin are damaged, making surgical scars more common — and sometimes more unsightly. In truth, even the best surgeons can’t prevent scarring altogether. However, more skilled surgeons will create cleaner incisions that more easily heal, making any potential scarring less noticeable. Plastic surgeons in particular are adept at hiding the location of scars so that small incision scars are virtually invisible. For example, breast augmentation incisions are often hidden beneath the fold of the breast, while facelift incisions tend to follow the hairline. In both cases, the scar can typically only be spotted if you’re actively looking for it. Being well versed in facial anatomy and understanding the emotional toll of facial scars, facial plastic surgeons will also conform incisions to the natural lines and creases on the face. If you’re interested in plastic surgery, rest assured that they have strategies in place to prevent any egregious scarring. Whether you get a scar from surgery or from an accident, there is some potential for complications during the scarring process. Scars don’t always heal properly and when this happens, the results can be painful and embarrassing. Painful scars occur when the incident that caused the scar damaged a skin nerve or when the nerve was pinched and damaged by the scar tissue itself. If your scar becomes painful, you should see a doctor for your scar treatment options. There are no over-the-counter solutions that will eliminate scar pain, no matter what some products may promise. Keloid and hypertrophic scars both occur during healing when the body overproduces collagen, causing the scars to “over heal” in a manner of speaking. Although they are very similar, keloid scars tend to be more extreme than hypertrophic scars, often resulting in bulbous raised tissue that extends beyond the injury site. In some cases, they may only be a slight embarrassment. However, keloid scars can, in some cases, become so bulbous as to be disfiguring. Sometimes scars just heal poorly. If you’re inclined to pick at your scabs or if your wound gets infected, you may find the resulting scar is puffy or discolored. Proper wound care during the healing process may not be able to stop a scar from being painful or stop the overproduction of collagen, but it can go a long way toward keeping normally forming scars inconspicuous. Genetics plays a significant factor in how your scars form. Those with certain skin tones are more likely to suffer from scarring complications. For example, people with darker skin tones, particularly those of Sub-Saharan African descent, are at a higher risk of hypertrophic and keloid scars. Of course, skin tone is not the only determining factor. You may also find yourself at a greater risk of scarring complications if one or both of your parents suffers from one of these types of scarring. Age is another significant factor when it comes to whether or not an individual will scar. With age comes less elastic and thinner skin. Add to this exposure to the environment compiled over decades and the skin just does not heal the way it used to. In short, smaller wounds that would disappear on the skin of a younger person will leave scars on older people. If you think that you’re at risk of excessive scarring or scarring complications, talk to your surgeon about these concerns during your initial consultation. It’s likely they will be able to put your fears to rest. After having a procedure done, it’s up to you to follow your surgeon’s orders and properly care for your body as it heals. Doing this is the first step in preventing unsightly scars. If scarring is a particular concern of yours, you should let your surgeon know, as they might offer certain alternatives to meet your aesthetic goals. In the meantime, follow these general tips when caring for healing wounds that are likely to scar. Keep the wound clean and well-dressed — Your surgeon will tell you when it’s okay to remove certain bandages, and will likely tell you how to clean the area. Never remove surgical dressings before your surgeon tells you it is okay. Don’t mess with it — In other words, no picking or scratching at scabs. The more you interfere with your body’s healing, the greater the risk for infections or other complications. Use surgeon approved antibiotic creams — Note the words “surgeon approved.” After a wound has closed, consult your doctor before using a cream. If the doctor says to not use a cream, then do not use a cream. Additionally, never use an antibiotic cream on a wound that is still bleeding. Doing all of the above and following your surgeon’s other care recommendations will increase the chances that your scar heals well and is less visible. Once a wound has healed completely, there will likely be a scar where the incision once was. If the scar is more visible than you’d hoped it would be, there are some options available to reduce its size and visibility. Remember that no treatment is guaranteed and there is no proven way to make a scar completely disappear. Use sunscreen — Sun protection is just a good idea for your skin in general, as sun exposure can cause numerous skin issues. However, sunscreen can also help keep your scar less visible. Sunscreen does nothing to take a scar and make it smaller or smoother. It simply prevents the hyperpigmentation, that comes with tans and burns, that make a scar more visible. Moisturize — The role of moisturizer in scar reduction has been up for debate. However, a 2012 study published in the International Journal for Cosmetic Science examined the role that moisturizers play in the reduction of keloid scars and determined that it had a positive effect. In either case, your skin will thank you for a little moisturizer. Try silicone gel sheeting — Also called “silicone scar sheets” or “silicon gel pads,” these gooey adhesives are credited with reducing hypertrophic and keloid scarring. Just apply the silicone sheeting to the affected area and let them do their work. Massage your scar — Massages are credited with softening and flattening keloid scars. Massages are also often used to help manage pain and itching as scars are healing. It’s important to note that massage will not help with pain caused by scarring complications. It’s also important to consult your doctor before massaging a surgical scar. If you are still early in the healing process, massages may cause further damage to the area. It’s important to note that the above treatments are typically most effective for new scars. Old scars tend to respond less to at home strategies. If the above strategies don’t work for you, don’t lose heart. There are other options for reducing the appearance of scars. If you’ve followed all of the directions and tried everything you could, but that ugly scar seems to be sticking around for good, your doctor may be able to help you where at home treatments could not. Laser resurfacing — This technique, which involves removing layers of skin in targeted areas via lasers, is often used to treat scarring from acne or stretch marks. However, laser resurfacing, also known as laser scar removal, has been shown to be effective against more established scars, like keloids. Dermabrasion — This technique uses a revolving tool to brush away the top layers of your skin and, in doing so, removes scar tissue. If this sounds too intense, you could opt for the lighter variation, microdermabrasion, which only acts on dead skin. However the latter will not be nearly as effective against substantial scars. Cortisone injections — A cortisone injection is a steroid injection that softens skin and helps hard scars — like keloids and hypertrophic scars — to shrink. Understand that steroid injections may need to be done in stages. Scar removal surgery — This must sound ironic given that surgery is what may have caused your scar in the first place. Surgical scar removal involves removing the scar and reattaching the skin. It would basically be a do-over for the healing process and should only be considered if there was a complication from scarring. If your scar is reasonably well healed and you simply wish it was less visible, this option is unlikely to provide the results that you are looking for. Scar revision surgery — Surgical scar revision is a less intense form of surgery that doesn’t involve removing the scar completely. Instead, it adjusts the scar to reduce its visibility by making it blend in more with your skin. The options listed above are among the most common strategies for dealing with scars. They are not, however, the only ones. Your doctor may also talk to you about techniques like punch grafts and cryotherapy. Certain other techniques, like skin grafts, are more suitable for other types of scarring. If you’re looking to reduce an existing scar, you’ve probably already started the internet hunt. It’s probably safe to assume that you’ve come across promises that creams containing vitamin E or cocoa butter will reduce the visibility of your scar within days, if not whisk it away altogether. Let us reiterate that there is no cream in any store that will make your scar disappear. What’s more, there is no significant scientific basis to support that either vitamin E or cocoa butter are effective against scars. You may have also noticed several other scar reduction strategies that we didn’t mention here. For example, bleaching creams that can help lighten the appearance of certain types of scars. They are particularly effective against severe acne scars or strongly discolored scars. However, they are not typically effective for scars as substantial as those caused by surgery. When considering at-home treatments, remember that there are numerous types of scars — from burn scars to stretch marks. The treatments we’ve shared with you are the ones most effective for surgical scars and complications that could arise from them. It can take up to twelve months for surgical scars to completely heal. If your scar is extremely noticeable a week after your procedure, give it time and wait for the swelling to go down before you panic. Additionally, no scar reduction strategy will work overnight, so stay committed. If you massage your keloid scar and don’t see results in a few days, don’t sweat it. It could take weeks to see results and they will only appear gradually. Even medical solutions, like dermabrasion, will take time. The surgical procedure itself may happen in a day but it will come with its own recovery time. Patience and persistence are your best allies in the fight for better looking and healthy skin. While no miracle product exists to completely get rid of a scar, silicone gel sheets have been shown to lighten, shrink and flatten scars. Here are the choices that have been deemed most effective by doctors and patients alike. The brand most recommended by doctors, Mederma Advanced Scar Gel is a great choice if you’re looking to reduce the appearance of old or new scars. 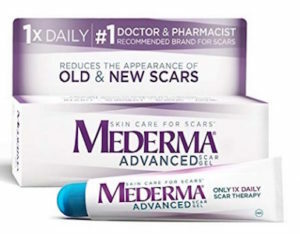 Mederma Advanced Scar Gel lessens the size, color, and overall appearance of scars in just four weeks, and you only have to apply it once a day. 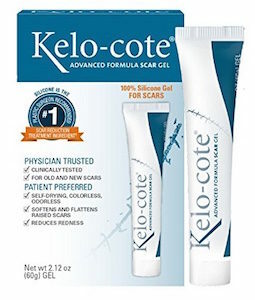 If you’re predisposed to developing keloid scars, Kelo-cote Advanced Formula Scar Gel may be your best bet. Its waterproof formula acts as an extra layer of skin that flattens and smoothes out scars, without causing dryness or itchiness. 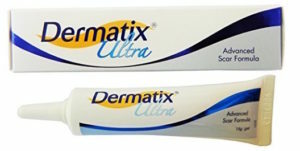 Formulated with Vitamin C, Dermatix Ultra Advanced Scar Formula helps prevent scar hyperpigmentation and photo damage. It’s also a great choice for sensitive skin, as its conditioning properties minimize irritation and allow for greater collagen production, which helps speed up the healing process. 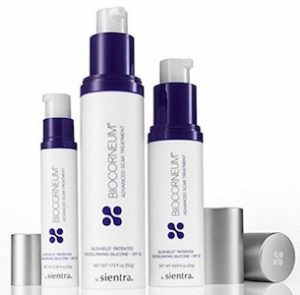 A combination of sun protection and scar reduction, BioCorneum Plus SPF30 Advanced Scar Supervision is the best of both worlds when it comes to minimizing scars. It’s effective on old and new scars, and if you apply the gel twice a day you’ll see results in three months or less. If you want to go with a classic silicone sheet instead of a gel, Scar Away is highly effective at shrinking and fading scars while preventing the formation of new ones. Unlike a transparent gel, the sheets are visible when worn. Despite this, they remain a comfortable and relatively discrete option.